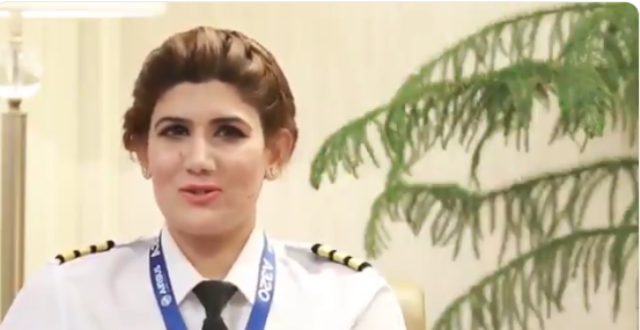 Maryam Mujtaba has become the national carrier’s first female pilot from Kashmir. The young pilot remarked that her dreams have come true. Pakistan International Airlines made the announcement on Twitter. The quirky pilot remarked that she can live inside a plane, if given the chance. She said that her parents have been supportive of her career choice, adding that they have known from the start that she wanted to be a pilot. They are the ones that got her enroled at a flying school. Mujtaba remarked that she was quite fortunate as the day she completed her course, she saw that PIA is hiring pilots. “I applied, passed the test and made the cut,” she said. She shared that the one thing she carries to all her flights is Quran. The young pilot said that there are rules and instructions which need to be followed in the cockpit. “A pilot must stay alert at all times,” she said. Many people get surprised when they see that she is flying the plane. Once she was flying an ATR plane to Bahawalpur, when one of the female passengers was pleasantly surprised to know that a woman was their pilot. The passenger requested to meet her and even clicked a picture with her.